After such a whirlwind of activity prior to closing on the house on May 9, we knew that we would need a break. Because we were planning to attend a wedding in Estes Park on June 21, and Tim’s high school reunion in Fort Morgan the following weekend, we decided to stay in Colorado. Southwestern Colorado seemed to be the perfect destination. Here we could just chill out or explore as we saw fit. 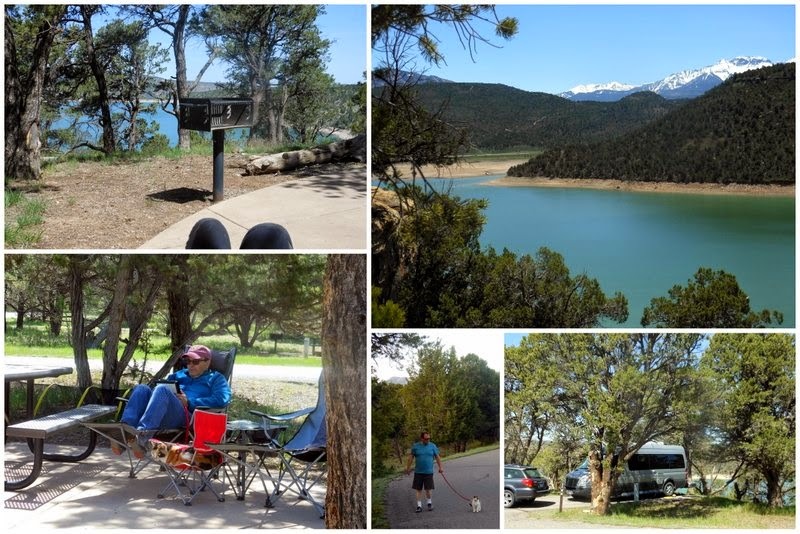 We finally left Loveland on May 14, for a stay of almost two weeks at Ridgway State Park just south of Montrose. We had a beautiful site with a view of the reservoir, and we enjoyed just relaxing, reading a bit and taking a few walks. We had never stayed in one spot for that length of time, but we found that we liked it. Ridgway State Park is located at the base of the high, snow-capped peaks of the San Juan Mountains and is only a few miles from the charming town of Ridgway. It was the perfect spot to catch our breath and prepare ourselves for future adventures. 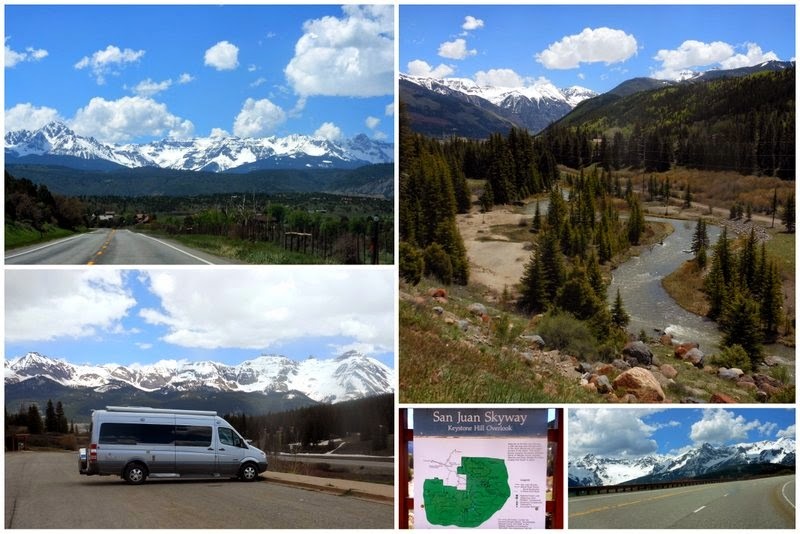 From Ridgway, we made our way into the heart of the San Juan Mountains as we drove south along the San Juan Skyway, one of the most scenic drives in America. We crossed Red Mountain Pass at 11,008 feet and settled into Cayton Campground, operated by the U.S. Forest Service, for six days. We were still at 9,000 feet in elevation, and winter was just releasing its grasp on the mountain. Snowbanks remained in the campground, and the adjacent Dolores River flowed fast and furious with snowmelt. During our visit the aspen leaves were just starting to pop out. We were able to witness the progression in the color of the aspen leaves, with fresh, pale green leaves at higher elevations, and more mature, deeper greens as we drove down the mountain. Spring also showed its colors in fields of yellow – dandelions, as it turned out. Who knew that dandelions could be so beautiful? 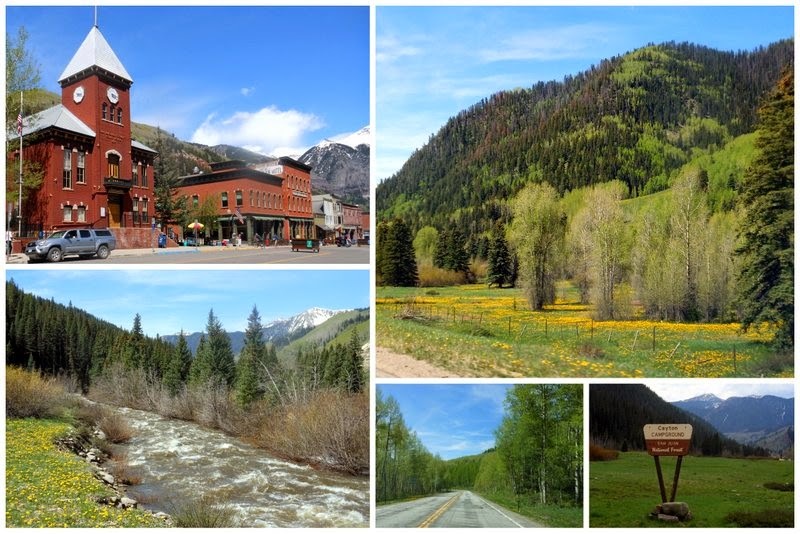 Since we had no internet or cell phone signal at the campground, we did drive into the Victorian mining town of Telluride, where we spent one delightful afternoon. Otherwise, we were content to hang out at the campground. We felt no pressure at all to be tourists.